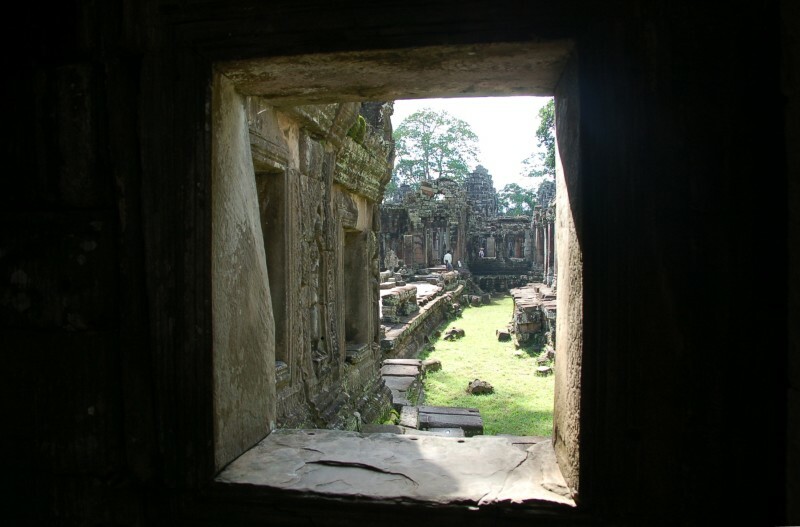 Our last free full day in Cambodia (Sunday) was spent seeing some of the sights beyond the main Angkor park attractions. We had planned on heading out on Saturday, but Sam got hit with some kind of ninja bug Friday afternoon, and by that evening, he was in full-blown chills, sore throat, runny nose and a stomach disorder that was out of this world wicked. So, Sam laid low Saturday and I took off with Jennifer, a fellow conference-straggler to see the floating village. By Sunday, Sam felt well enough to brave thirty minute stretches without a toilet, but we still didn’t get started until around 10:30. So much for getting those crowd-free photos. This, as it turns out, wasn’t so much of an issue, anyway. 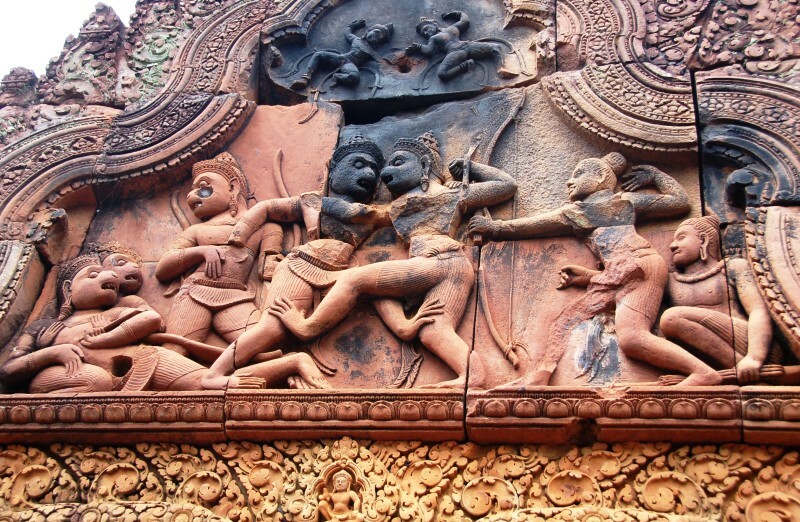 (Or, Banteay Srei, depending on who’s doing the spelling), which is 37 kilometers from Siem Reap center. We originally planned on renting bicycles for the day (there are a ton of options for this and the bikes around town looked pretty decent) — white bicycles is a great choice because the proceeds go to local projects — but Sam wasn’t quite there yet, so we rented a remork-moto with Jennifer who wanted to see the sights, too. I think we paid around 20 USD or so for the day, which is probably a little high for the going rates at the moment, but totally worthwhile. Just riding in those things is fun! It’s a great way to see the countryside. 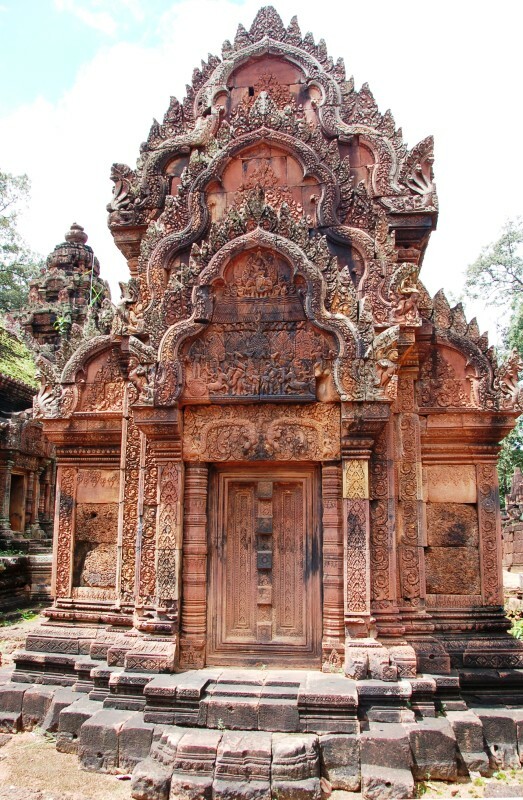 So, around 45 minutes later, we pulled up to the pinkish temple Banteay Srei dedicated to the Hindu deity Shiva. 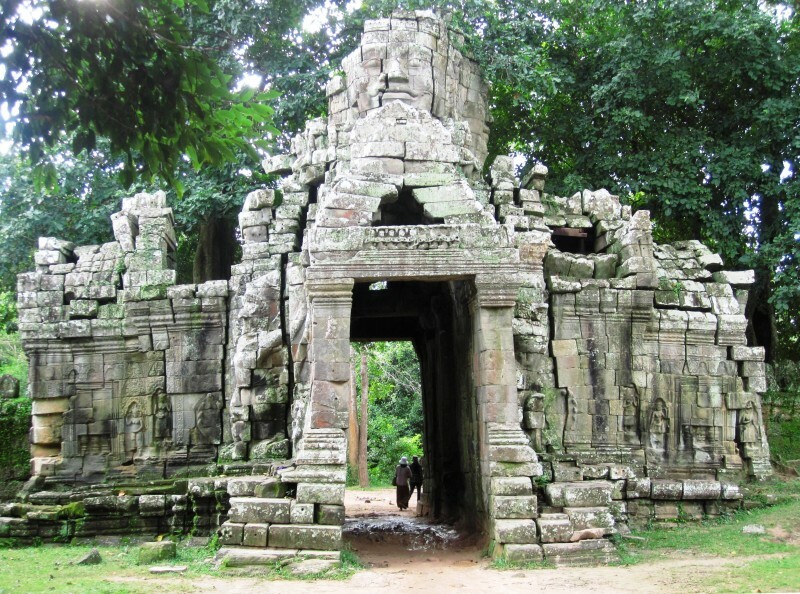 Unlike most of the other structures within the Angkor Archaeological park, this temple wasn’t built by a king, but rather, by a Brahman starting (the date is still being speculated) around 967. 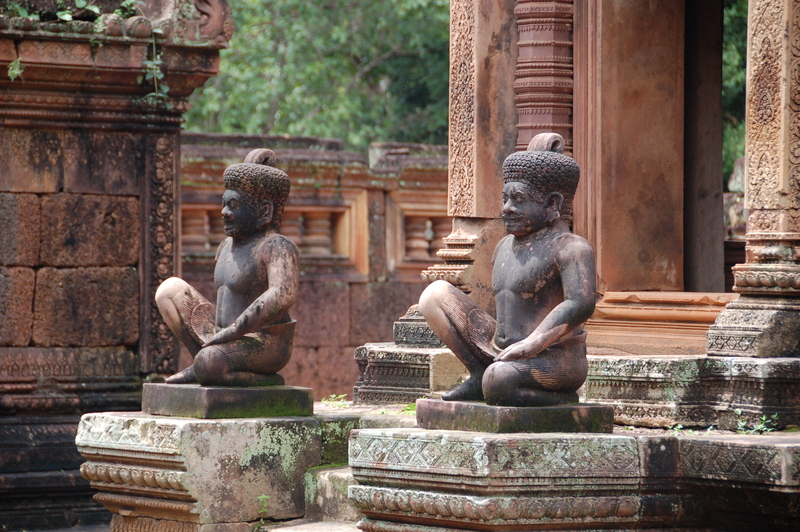 Bantay Srei is considered one of — if not the most — beautiful of Angkor structures, and I can see why. The glowing, pink stone, the intricate carvings along every square inch of facade, the (mostly intact) statues of gods and mythological creatures guarding ornate doorways arched with beautifully rendered Ramayana-illustrated lentils, it is one of the few places where hordes of people don’t matter so much because you’ll be so busy zooming in on all of the details. 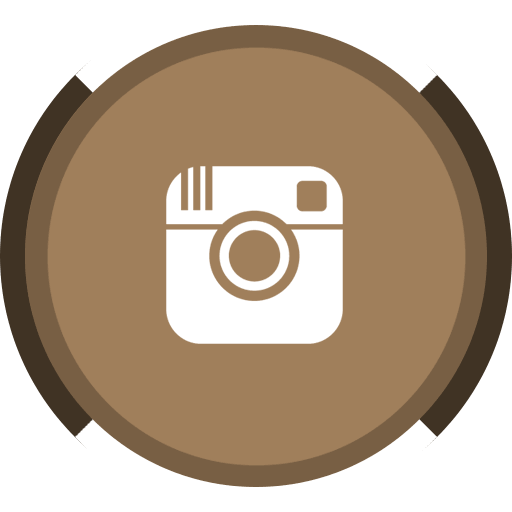 Like this! 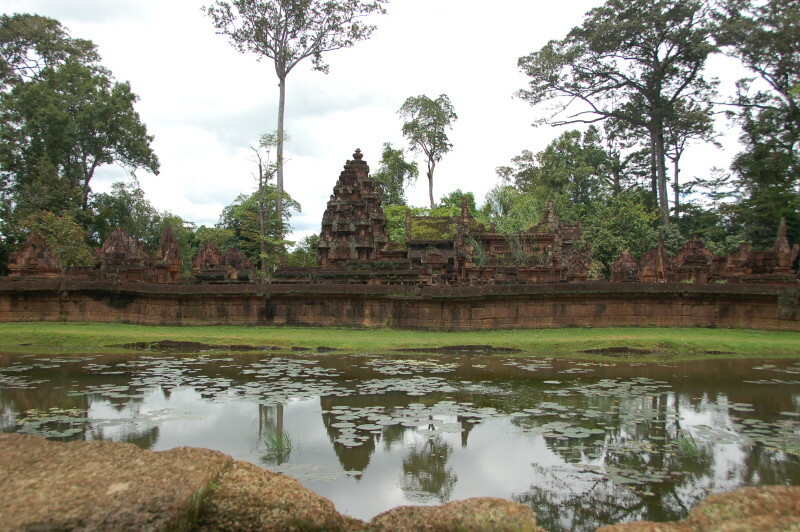 Exiting the temple, you cross between lily ponds where women wash their clothes while children splash about in the water, serenaded by the sounds of a traditional Khmer orchestra. 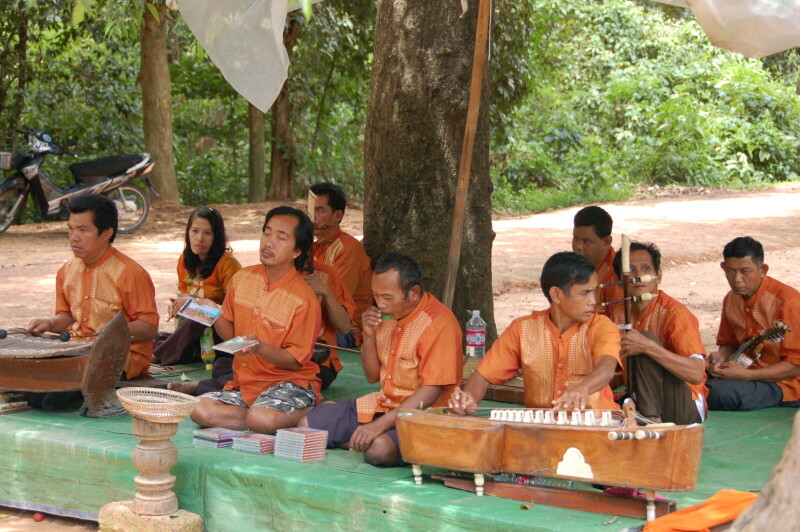 The musicians are all maimed victims of landmines, and purchasing a CD of their music goes toward supporting their project. These orchestras were in various parts around Angkor park — I think the government provides a special license for them to perform — and seeing so many men and women who’ve survived this trauma really hit home with me. I’ve always heard about Cambodian landmines and the terrible devastation still realized by the citizens there, but seeing the results that these men and women and children live with for the rest of their lives is sobering, to put it mildly. I don’t really know how to explain it without sounding trite, so I think I’ll leave it at that. 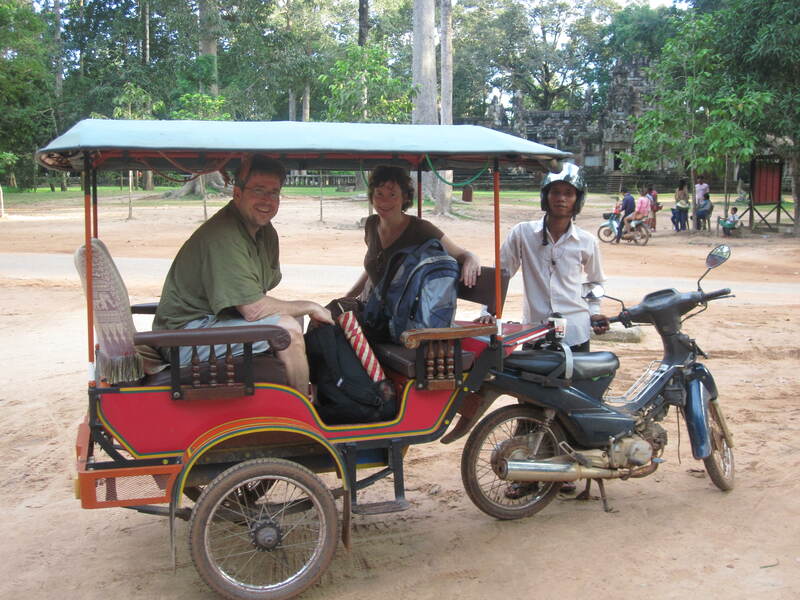 Heading from Banteay Srei back towards the main Angkor area, we made a stop at an NGO, the Cambodia Landmine Museum. 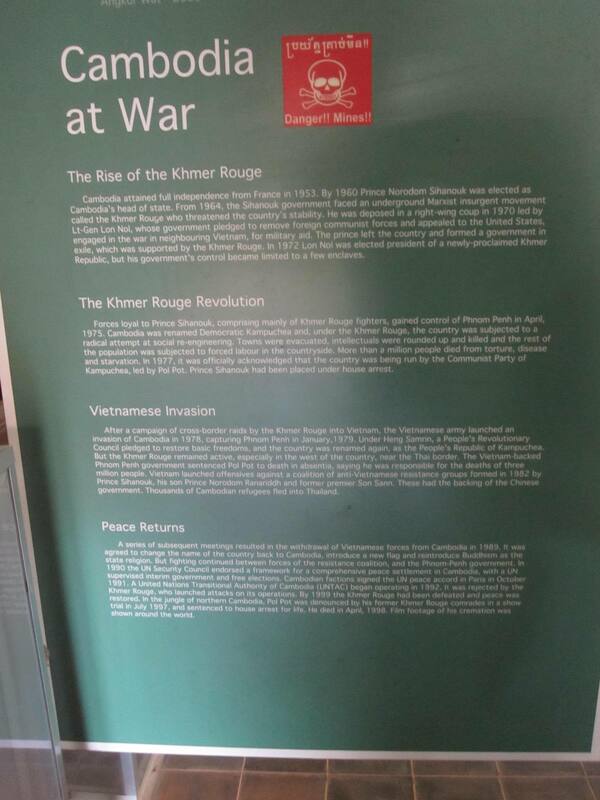 Founded by a de-miner name Aki Ra, who took it upon himself to locate and deactivate mines across the country, the museum itself is extremely well worth the visit. Informational displays like the one to the right here were everywhere, and really provided an excellent education to the ubiquitous existence of these weapons that still ravage lives and create orphans today. I do, however, wish I would have taken more pictures of the displays, because Sam and I both found it difficult to concentrate on the information when a probably well meaning but bizarrely attention-seeking volunteer from California dressed in a fake military uniform kept opining about random things nobody had asked him about and drumming his fingers loudly over glass displays when ignored. Really?! 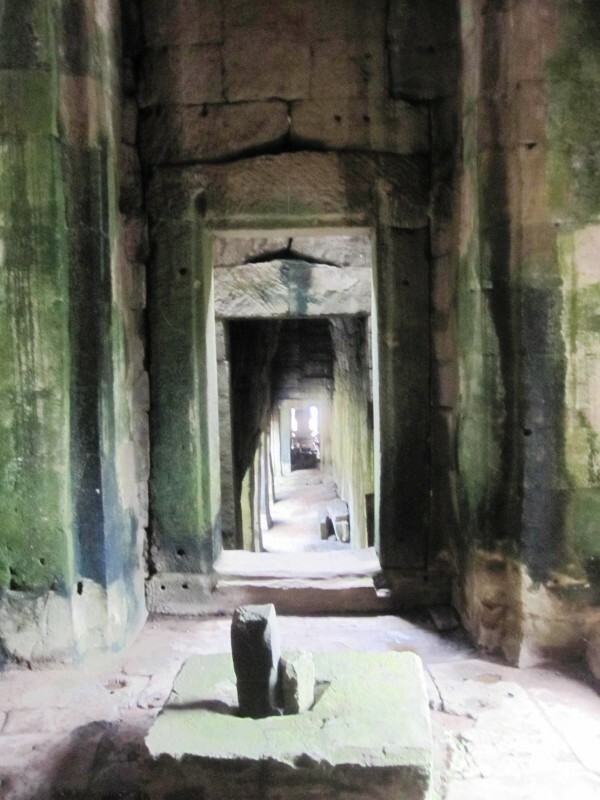 Hardly mentioned in the tour books and given a two or three star rating (out of five) in the local travel pamphlet I picked up, I actually think Banteay Kdei might have been my favorite stop of all the Angkor sites. BK has a sort of mystical, dignified quality about it that I sensed immediately, which probably had a lot to do with the fact that there were not three hundred people jammed into the area at any given part of the day. No, BK was quiet, and the ruins felt almost as if you were discovering them yourself. 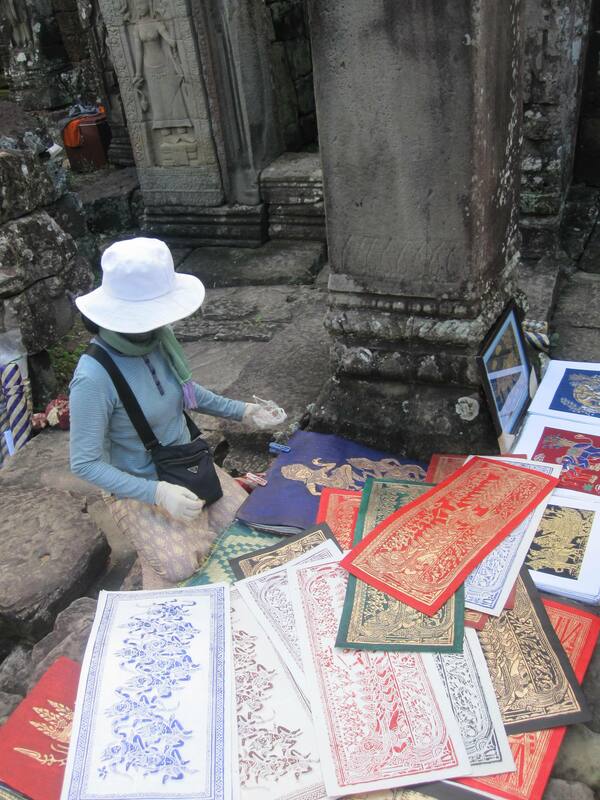 Well, that is until the nice lady just around the corner finagles her wares … but at two “rubbings” for $5, who can resist! 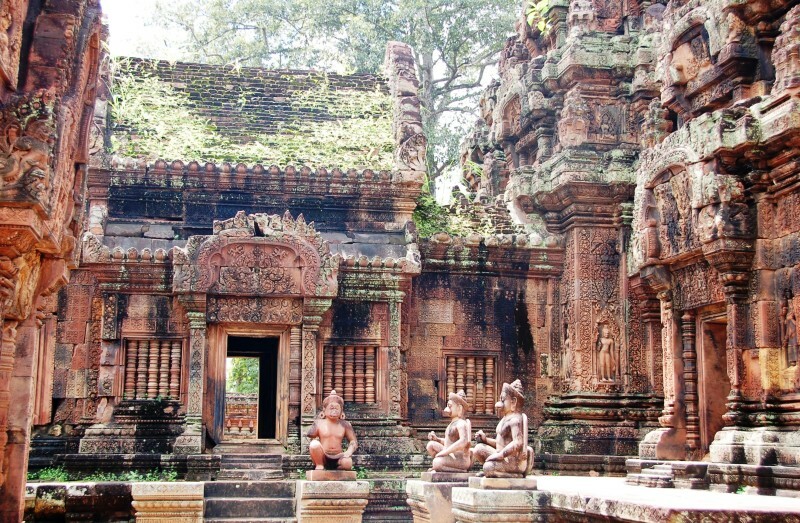 Banteay Kdei is a (late 1100’s) monastery, largely in ruins, but that’s part of the charm. 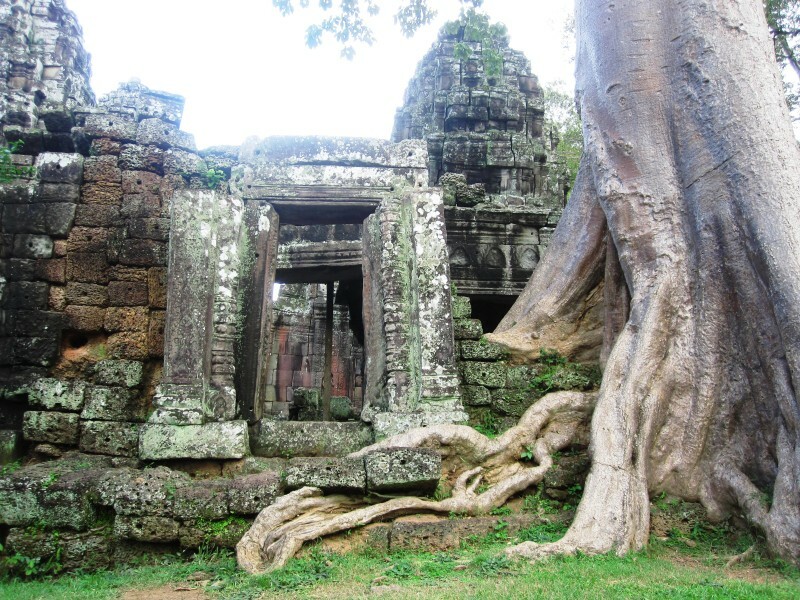 It even has a little of that other-worldly Ta Prohm vibe about it, with giant roots crawling over leaning, stone doorways. 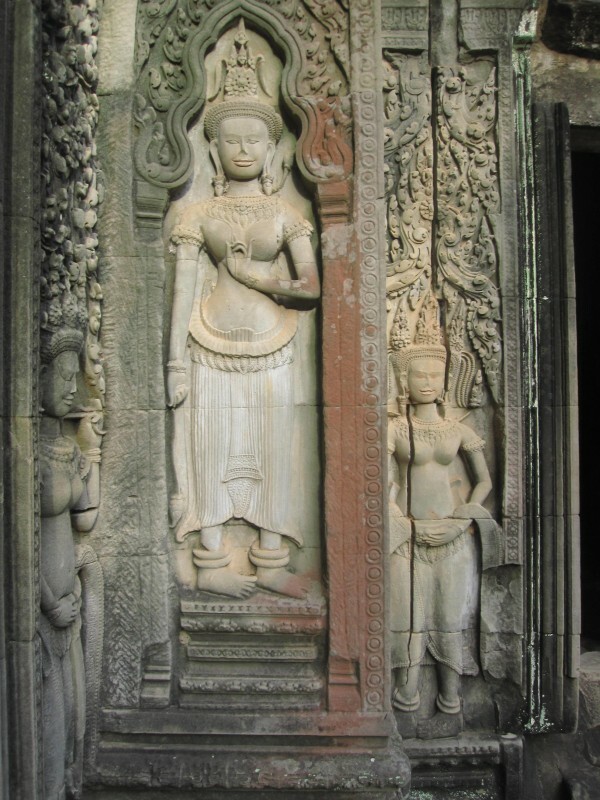 Leaving BK, we passed through more of the Jayavarman VII “Four Faces of Avalokiteshvara” gateways, which I firmly believe should be implemented in any new city plan. 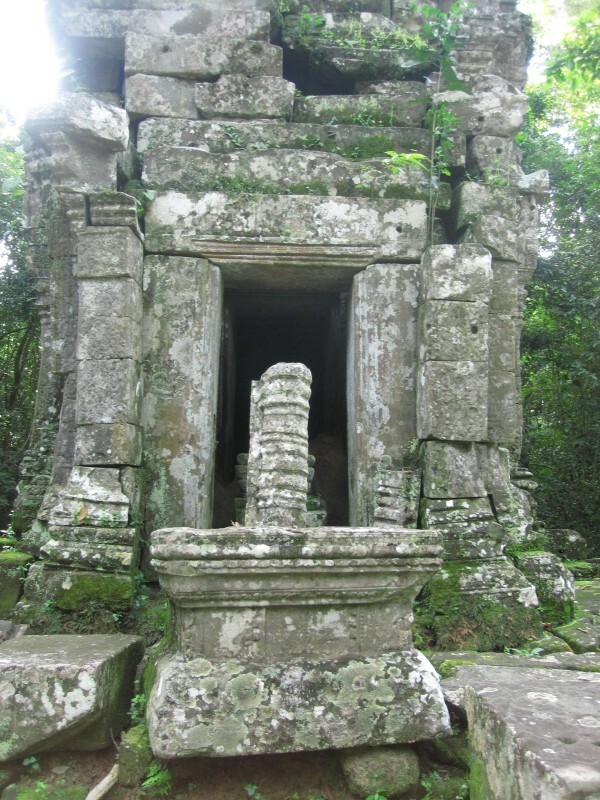 Our last stop brought us just outside the west gateways of Angkor Thom, where we had paid homage to the Bayan temple on Friday. It was a great time of day to visit; dusk was settling in, and the crowds had thinned substantially. Another neat thing about this place is you can basically walk all around and through it. 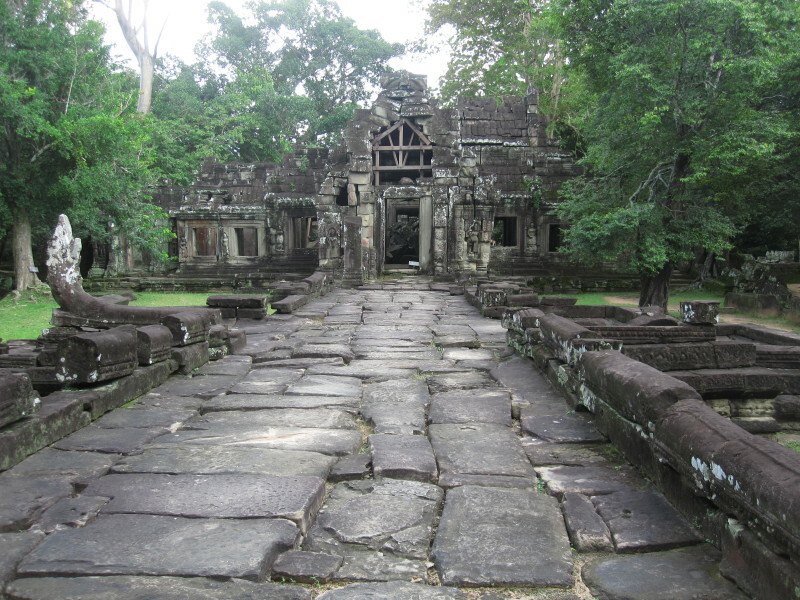 You can’t really tell from the picture above, but the whole thing is more or less built like an elaborate pyramid, so that steps traverse all along the sides, enabling one to crawl along the outer walls and really get acquainted with those apsaras. 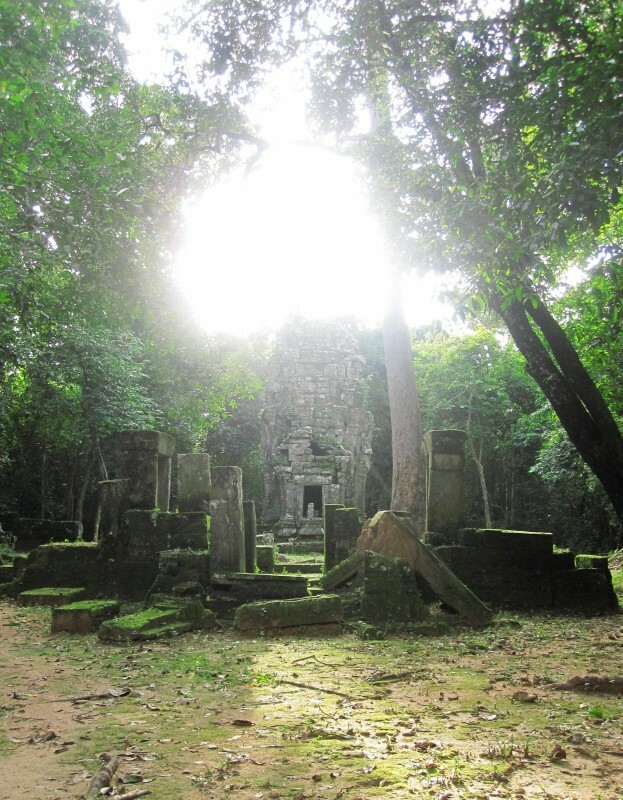 Ta Keo was apparently struck by lightening while being constructed, and perhaps because of this unlucky portent, never finished, although it is touted as the first Angkor complex to be built entirely of sandstone, for whatever that is worth. Across the street and just slightly to the north of Ta Keo, lies the Chapel of the Hospital, which was actually what we’d come to see in the first place when we chanced upon Ta Keo. Being with medical folk, I thought the chapel was an apropos ending to our day. The hospital itself is but dust from the past, but the chapel remains, complete with theme-appropriate reliefs like one of a pregnant woman and even one depicting a surgery, I believe. 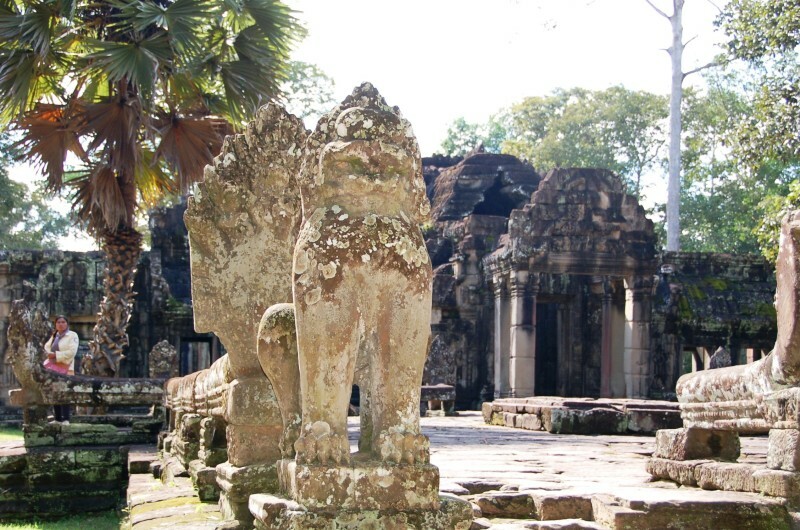 We all enjoyed seeing it, but I think given the overwhelming choices of things to view at Angkor park, unless a person has a specific reason for visiting, there are lots of other far more elaborate sites to while away one’s afternoon. The cool thing about this place, though, was the utter tranquility. Not a person (than us) to be seen; I think we even cleared away a few spiderwebs! 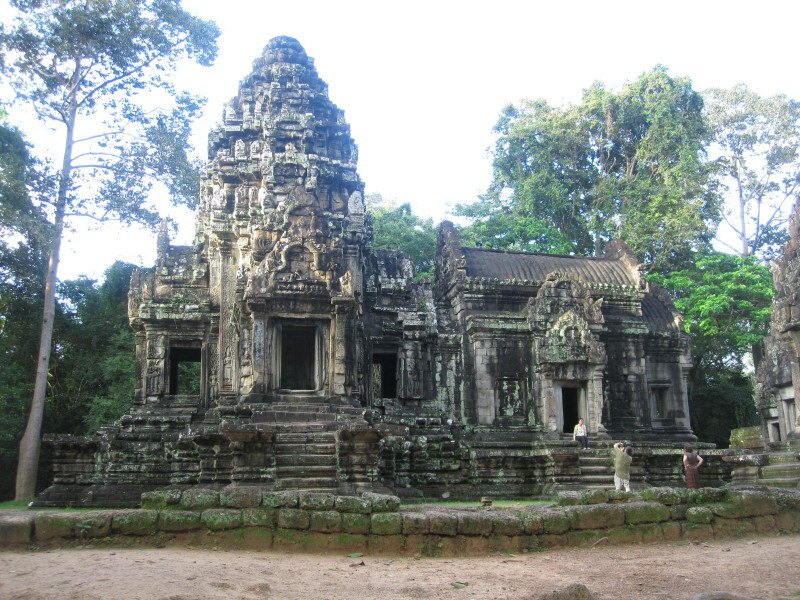 Okay, so as a wrap up, here are a few things about the Angkor park I left out earlier. 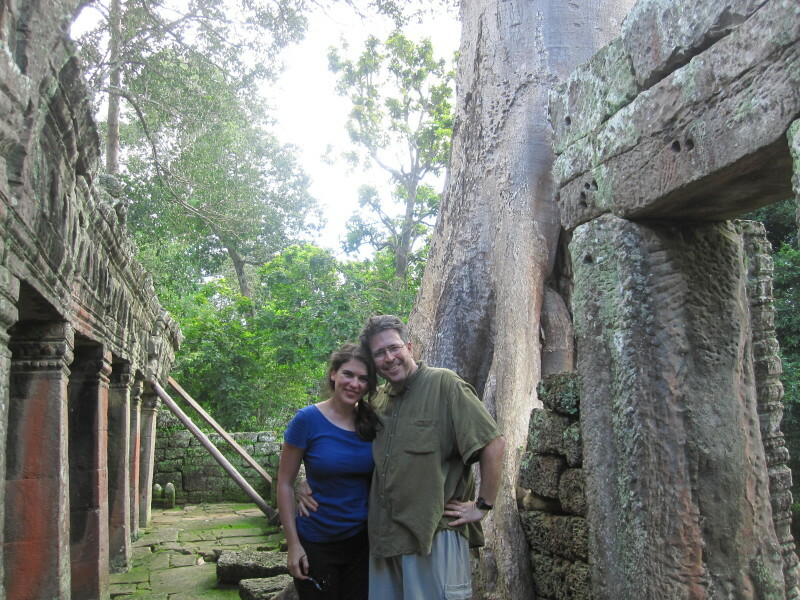 I’ll start with this picture of Sam and me at Banteay Kdei. Notice the holes in the stonework to the right of us? You’ll see them everywhere here — in the walls, all over the floors, everywhere — and I read that they were purposely bored into the stone during the construction phase. Poles were inserted, thereby allowing these massive slabs to be transported and arranged appropriately. The second item of interest, and definitely the more perplexing, is the pervasive use of Lingas, which are, to get to the … um, point … phallic symbols. These lingas are also seen everywhere; in fact, there is a river embedded with them that we never had the time to see, but it just goes to show how important they are. From what I understand, lingas represent the Hindu god Shiva and are the symbol of male creative energy. 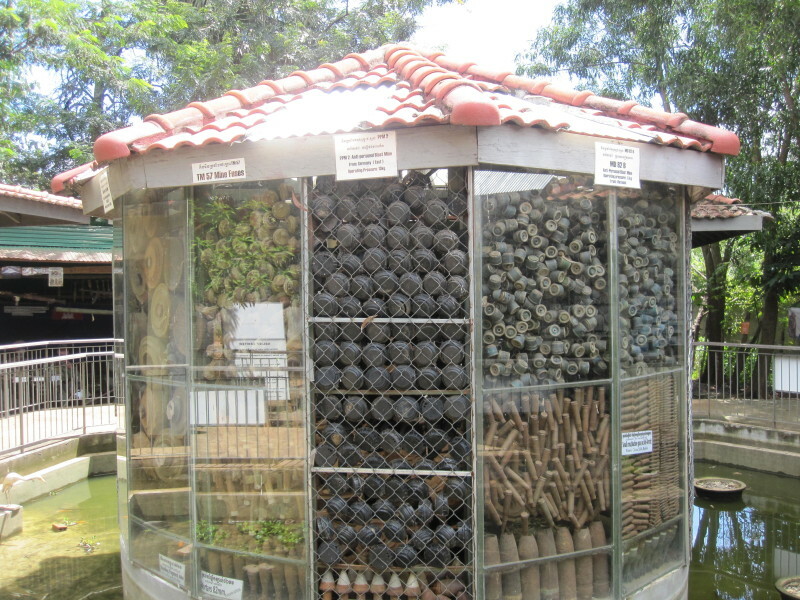 Almost every place we went had intact or vestiges of these. The linga is placed inside the yoni, which represents the Hindu goddess Shakti, and is the symbol of female creative energy. 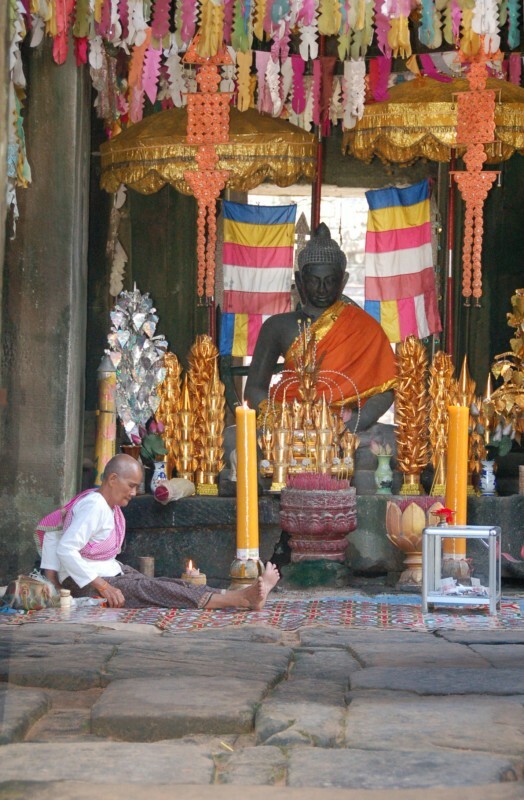 Water is poured over the linga and yoni, and drained through gutters that filter around the temples, thus charging the temples and the pilgrims alike with the energy of creation. The third item of interest are the moats and/or ponds that currently or at one point surround(ed) each temple. The guide from our Friday tour informed me that this water served a structural purpose, in that it kept the soil around the buildings moist, feeding into the stone so that each slab remained swollen, thus fitting securely into the other. 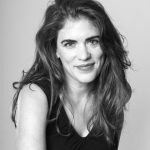 I’d never heard of this before, but I thought it was an intriguing idea. Coming up: last post on our Hong Kong-Cambodia trip: a day in Hong Kong Island!